Presentation recorded on November 1, 2018. 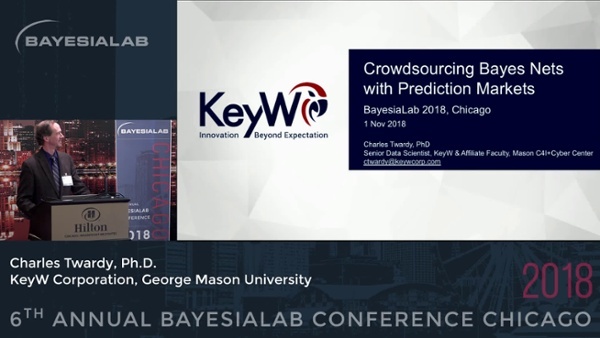 In this talk we look at how the SciCast system uses prediction markets to efficiently crowdsource both structure and parameters of a Bayesian network. Prediction markets are among the most accurate methods to combine forecasts; forecasters form a consensus probability distribution by trading contingent securities. A combinatorial prediction market forms a consensus joint distribution over many related events by allowing conditional trades or trades on Boolean combinations of events. In general that is infeasible, but by using a Bayesian network underneath, it becomes tractable for large problems. As a bonus, the market solves some difficulties with Bayes net elicitation, including: knowledge bottlenecks, divided or overlapping expertise, and some impossibility theorems that affect other aggregation methods. We have a formal paper in press in J. Artificial Intelligence Research. Dr. Charles R. Twardy is Senior Data Scientist with KeyW Corporation, and affiliate professor at George Mason University. From 2011 to 2015 he led the George Mason DAGGRE and SciCast teams for the IARPA ACE and ForeST forecasting challenges. The final result was a novel Bayesian prediction market that allowed users to make forecasts conditional on the outcomes of other forecasts, at scale, on the fly. Forecast accuracy improved by about 35% over baseline, with much greater expressivity. From 2015 to 2016 as Senior Data Scientist for NTVI Federal, he helped the Defense Suicide Prevention Office establish procedures for handling and analyzing sensitive personal data, and provided sound approaches to hot-spot detection. In late 2016 he joined Sotera (now KeyW) where he has worked on two DARPA big data programs, and on IARPA CREATE, a successor to IARPA ACE. Dr. Twardy focuses on evidence and inference with a special interest in causal models, Bayesian networks, and Bayesian search theory (especially wilderness search), and information theory. He also has worked on argument mapping, trajectory clustering, sensor-selection, counter-IED models, source credibility, image recognition, environmental decision-making, and epidemiology. He received a Dual Ph.D. in Cognitive Science and History & Philosophy of Science from Indiana University, and a B.A. from the Interdisciplinary Majors program at the University of Virginia.